POOL: In the final night of play in the Rawai Pool League, Division A Champions Black Sheep went to Mango Bar to cap off what’s been a fantastic season. However, their plans to end a great run with a final victory were swiftly put to rest by the home side. Mango’s Mike beat Riky, while Black Sheep’s Taka was found napping in his chair and lost to Ian. Kevin showed some great skill to pull back a point for the visitors, but the final singles match between Thai compatriots Thong and Goh gave Mango another point heading into the doubles. An unlikely comeback in the doubles was swiftly extinguished by Thong and Gregg who twice ran seven balls after having ball in hand to seal the win. Black Sheep clawed back the Beer Leg, but lost the match 4-3. Future Bar faced second-placed Shot Bar in a match that could determine whether White Hart or Shot Bar would finish the season in second position. A loss here for Shot, and a victory for third-placed White Hart might swap their positions in the final league table. With some key players unavailable for Future, a near-impossible task looked suddenly quite possible when both Harry and Pan shockingly lost their singles, handing Future Bar a comfortable 3-1 score going into the doubles. However, Shot Bar played some amazing pool in the doubles games to draw the match level at 3-3. Alas, the near-impossible task was self-fulfilled with Shot Bar winning the Beer Leg and securing their second-place position for Season 14 and losing to to overall winners Black Sheep only by leg difference. White Hart hosted a recently resurgent Masaya Bar, but it was the home side that turned on the skill to take all four singles games. Last year’s champions White Hart lost only a single frame in the singles and remained conscious of needing the biggest score line possible in case Shot Bar lost to Future. Masaya weren’t rolling over, however, and fought back to with two 0-2 wins in the doubles. The Beer Leg went to the hosts, and the final score was 5-2 on the night. White Hart end a very respectable third-place in Season 14. Pita Bar were also looking to to improve their final standing for Season 14 by overtaking Mango Bar. Their opponents were bottom-placed Tropical Sands, who are well-liked for the great entertainment and sportsmanship they bring to their matches. The visitors started out well, with captain Fuzz taking points from Pita’s Stefan. It seemed like Stefan’s slick new haircut failed to give him the cutting edge. The remaining singles went to Pita, with Richard, Flob and Grant all winning their games 2-0 to put Tropical Sands 3-1 down going into the doubles. With bar owner ‘Dangerous Ding’ sitting out this week, Pita still managed to win both doubles and the Beer Leg with ease to give them a 6-1 victory in their final game of the season. Black Pearl travelled to Spot bar to face an all-male side. Even with superstar Eddy back on the team-sheet, Spot just couldn’t stop Bang who was banging the balls in all night. Dave wasn’t at the races at all this week after his appearance in the final of a big tournament the previous week, and the scores were left finely balanced at 2-2 after the singles. Despite their foregone relegation, Spot Bar refused to go down without a fight, and it needed the final frame of the night to decide the victors. With the Beer Leg ending 1-2, the final points went to visitors Black Pearl who end Season 14 in sixth position. Division A’s final game of the season found Freedom Bar playing host to Orange Bar. The visitors had one last chance to break their 100% losing run, but alas the French team maintained the same consistency they’ve shown all season. The only bit of small piece of joy the French team could muster was Pierre beating Big Dave in the singles. With Popeye getting his voice back, and many shouts of “Freedom!” coming from the bar, the homeside took an easy 6-1 victory. Orange Bar are left cemented to the floor of Division A, and will see new opponents next season in Division B. Season 14 of the Rawai Pool League introduced a second Division to accommodate a rapidly growing number of teams. Division B produced a great amount of fun for players, but also some top-quality play, especially from this year’s champions Rose’s Bar. Heading into their last game of the season, they were on the cusp of a scintillating unbeaten season. Standing in their way? The all-lady team of Baroque Bar, which included the top-ranked female player Pang. The sides were not separated in the singles, with Pang pulling out a great victory against Mike, while Philipp managed to draw the score even at 2-2 against Pickpook. The girls then changed gears in the doubles, and without conceding a single frame in the doubles, ended their season with a fine victory over the newly-crowned champions. Roses are denied an amazing 22-match unbeaten run in their first season, but will play in Division A next time around. Win or lose Stor Bar would stay in second place and be promoted to Division A. They travelled up the back road to face Islander B. The match started off with some upsets, with both team’s top-ranked players losing their singles, but the singles games left left points shared. The bottom-ranked Islander B put on a brave performance, but Stor Bar provided a very classy show only dropping a single frame over doubles and Beer Leg games to give them a fine 2-5 victory. Next door, Black Bull hosted O’s Bar for a match between two Season 14 newcomers. It was third place versus third from bottom, but the sides were a lot more even than the ranking table would suggest. Every game bar one required a final frame – only Black Bull owner Franck managed to win 2-0. The close fought match could not be settled in either the singles or doubles, and the score was level at 3-3 going into the final Beer Leg. With a superb atmosphere at Black Bull, and O’s Bar managed to secure the 3-4 upset over newly-promoted Black Bull by winning a hard fought final frame of the match. With league positions shuffling throughout the final night of the season, it was Stoned Crab hosting Pink Sheep with the pink girls battling for an end-of-season fifth-place if other results went their way. Stoned Crab player John O. wasn’t available to play, and the loss of Division B’s top-ranked individual was notable as the Pink Sheep girls took an early 3-0 lead. Only Stoned Crab owner Sam managed to give his team some hope out of the singles. But the comeback was realised when both doubles went to Stoned Crab taking the match into the Beer Leg with the score at 3-. It needed a decided match frame, but the Pink Sheep girls managed to save themselves from the crab’s claws, winning the match 3-4. 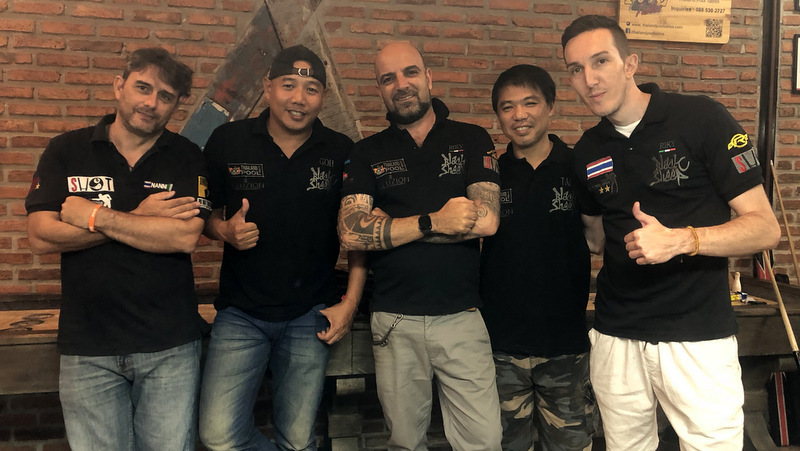 Moving down to Rawai beachfront, White Hart BBQ, who also were on 30 points and playing for fifth, visited second-from-bottom Moonlight Bar. Captain and top-ranked player Gero kicked things off with a good 2-0 win, but German compatriot Friedhelm couldn’t follow up, losing to Moonlight’s Claudio. The singles ended with a 1-3 scoreline, and the visitors were close to victory. Gero again shone in his doubles to give White Hart BBQ the victory they were after, but they couldn’t seal the beer leg and the match finished 3-4. Despite their victory White Hart BBQ were pushed down to sixth place, with Pink Sheep ending above them only with the help of leg difference. The final game of the season saw Islander A welcome the Kilt’n Haggis. Islander A took the game by the scruff of the neck in the singles to sit on a 3-1 scoreline. Only Bo could manage to get a point for Kilt’n Haggis. That form was maintained through the doubles and Beer Leg, with the homeside winning all remaining legs 2-0. Wayne was the star player on the night with faultless play never missing a ball. Islander A’s win jumped them above The Stoned Crab in the final standings. A huge congratulations to everyone involved in Season 14 for the great play and especially for the charity money raised by all bars. A very special thanks to Pi Ding, Eric Colombo, Richard Hearne and Barry Craig for their efforts to make the RPL happen. Thank you also to league sponsors Thailand Pool Tables. We look forward to the upcoming Season 15 of the Rawai Pool League, which will commence on Monday, Feb 11. Please visit http://www.rawai-pool-league.com/ for information on how to join.